For anyone who has been in the company of medical professionals, it is immediately apparent (and possibly nauseating) that we share a complex jargon that can be hard to switch off. Recently, a colleague and I were musing over the medical hijacking of familiar English words. Wandering through the hallways of a hospital during change of shift, it is not uncommon to hear descriptions of “heart murmurs appreciated,” “diet tolerated,” and “catheters colonized.” Are those with a “productive cough” to be proud of their contribution to society, while those with a radiologically “unremarkable liver” considered subordinate citizens, I wonder? The impact of language in medicine extends far beyond vocabulary. Every medical trainee becomes well-versed in the “SOAP” format for presenting patients: “Subjective, Objective, Assessment, and Plan.” This widely used format evolved from the Problem-Oriented Medical Record first proposed by Lawrence Weed, MD, an academic physician and developer of one of the first electronic health records, in the New England Journal of Medicine in 1968. By dividing impressions of the patient into “Subjective” and “Objective” components, the presenter can substantiate the patient’s own experience of their symptoms such as “feeling feverish” with concrete information such as a recorded elevated temperature. He or she then moves on to the “Assessment” or conclusion statement—the grand finale. Here, the presenter skillfully synthesizes all of the data gathered and makes an argument for a particular diagnosis that will shape the treatment plan. A true connoisseur will list several possible diagnoses in order of likelihood and offer evidence for or against each one, in this way convincing the listener that he or she has cast a wide net and carefully considered multiple possibilities before reaching the conclusion. Finally, we arrive at the “Plan,” which is the first time that the presenter proposes a treatment plan based on the working diagnosis. 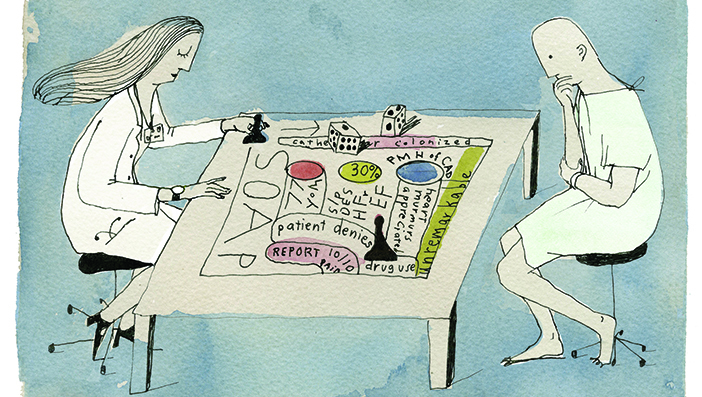 By holding the SOAP format sacred, and in communicating about patients in this disciplined way, physicians like Weed believed we could optimize the care provided to each individual patient and minimize “anchoring bias,” or the willingness to accept another’s initial diagnosis without further thought. As a generalist, I also have encountered the power of language in effectively liaising with specialists. On an emergency medicine elective as a medical student I was tasked with consulting the on-call cardiologist about a patient with persistent chest pain in the setting of a recent cardiac catheterization. Several minutes into our conversation the cardiologist asked a series of questions concerning the patient’s symptoms and medical history that I felt ill-prepared to answer. Sensing his mounting frustration, I apologized and sheepishly handed the phone to my attending to finish discussing the patient. “It’s all in the way you sell it to them,” I was told later. “You’ve got to know your audience and hook them with your opening line.” Mrs. Bowker, my fifth-grade English teacher, had been right all along. Yet as a physician-intraining you quickly learn to code switch between the methodical way of communicating with colleagues and more natural speech with patients and families. When I began my pediatrics clerkship during medical school, one of the most terrifying parts of the six weeks that lay ahead of me had little to do with examining inconsolable infants or forging connections with jaded teens at risk. Instead, the challenge lay in deciphering the craft of presenting on “family-centered rounds.” A well-established model of care in the inpatient pediatrics world practiced by more than 44 percent of pediatric hospitalists in the US, it has given new life to the age-old, forgotten tradition of bedside rounds by discussing the patient in their room and incorporating patients and families in decision-making. 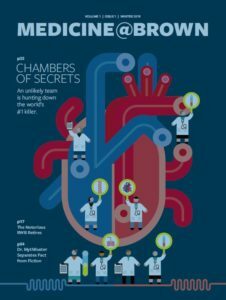 While studies show that family-centered rounds improve parental satisfaction and coordination of care, as a student I found myself having to repress months of training how to “talk like a doctor” and relearn the art of everyday communication while involving parents in complex medical discussions in their own lexicon. Reflexively, we emphasize the subjective when talking about patients by using terms such as “the patient denies drug use” or “he reports 10/10 pain.” For the recently sober patient, or those who consciously avoid illicit substances, or for patients with persistent pain of unknown etiology, these terms can be perceived hurtfully. As physicians, we also thrive on acronyms. Why waste time talking about the “77-year-old male with past medical history significant for systolic congestive heart failure with 30-percent ejection fraction who presents with shortness of breath” when I can just say “77yo M with PMH of HFrEF (EF 30%) p/w SOB?” Much to the patient’s (and physician’s) horror, commonly employed acronyms can be misconstrued as a reflection of the provider’s opinion of them or their family members. An unfortunate double entendre. The practice of medicine undoubtedly relies equally on data and how they are expressed. Much like every clinical test we use, increased sensitivity (toward patients or colleagues) and specificity (of language utilized) results in far more effective care. And as I’ve learned repeatedly, good communication, like a whopping heart murmur, is always appreciated.